Of all the unpopular things in the natural world, lawn weeds must be near the top of the list. Like mosquitoes (perhaps Number 1), they seem to exist only to vex us. But even mosquitoes feed lots of creatures, while weeds appear to have no redeeming qualities whatsoever. So it is without reservation or condition that you are advised to get rid of them. For good, if you're lucky. 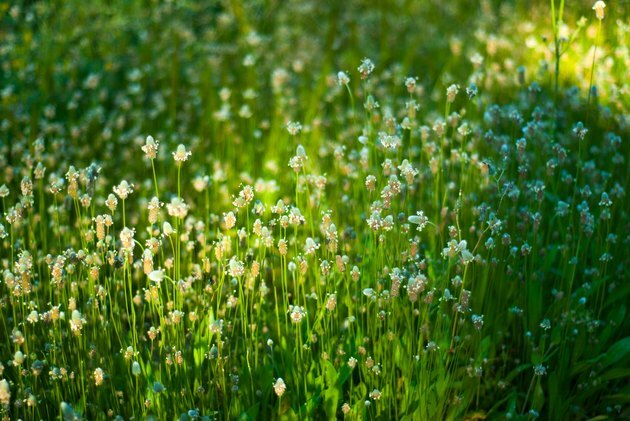 With that noble goal in mind, here are 16 of the most common lawn weeds and how best to fight them (choose your poison, or not). 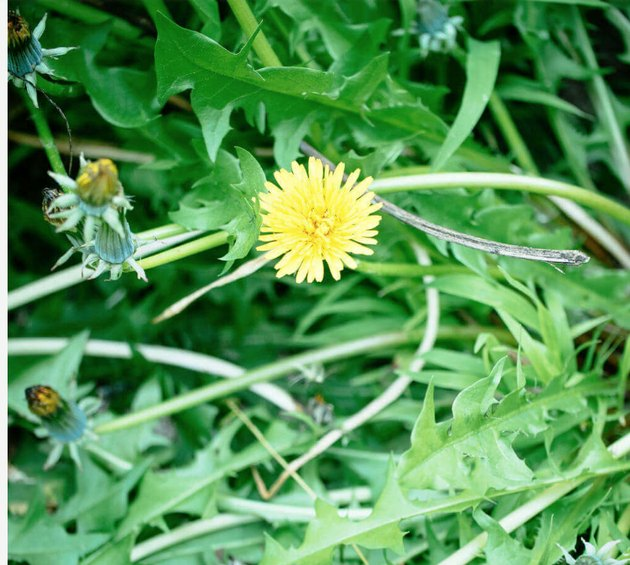 Dandelions are perennial wildflowers related to asters and daisies, but which are widely regarded as weeds. Dandelions thrive in areas where turf is sparse, but they seem to be able to survive anywhere, and most lawns have at least a few. Not surprisingly, they spread by seed (which often come from your neighbors' lawns). The difficulty in control comes from the fact that the root will resprout each year, while the seed heads can distribute many hundreds of new seeds. Organic treatment: Dig up with a dandelion fork to get the long tap root; the plant will regrow if the root remains. Pull them before they develop the fluffy, white seed heads, which spread hundreds of seeds in the slightest breeze. Inorganic treatment: Herbicide containing 2,4-D. Apply in early fall to kill the plants' roots. White clover is a short-lived perennial that spreads with horizontal runners, or stolons, that sprout roots. 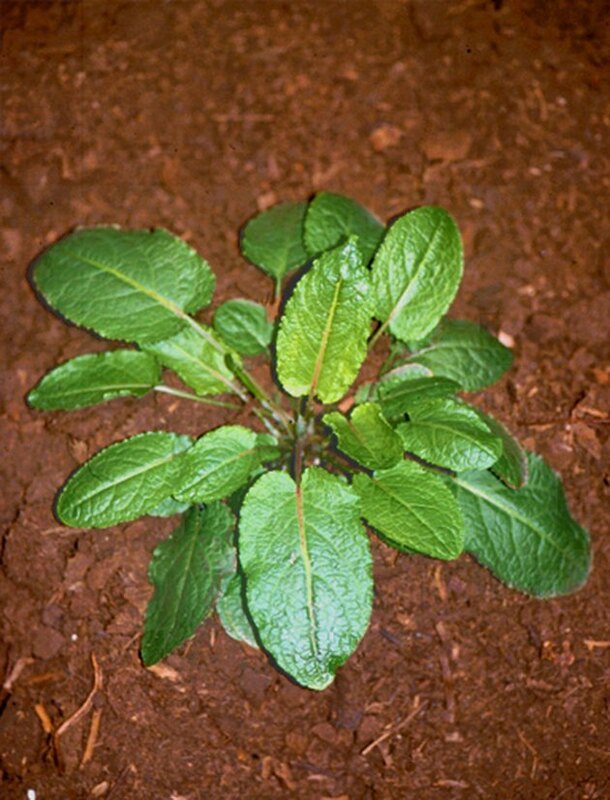 It can thrive in low-nitrogen (unfertilized) soil and is difficult to kill with organic methods. There is a current movement afoot to reconsider white clover as a desirable component of a turf lawn, but most people still want to irradiate it. Organic treatment: Hand-pulling is the most effective method. This works best in wet soil. Corn gluten can be applied as a pre-emergent herbicide in early spring, but this precludes overseeding with grass in fall. 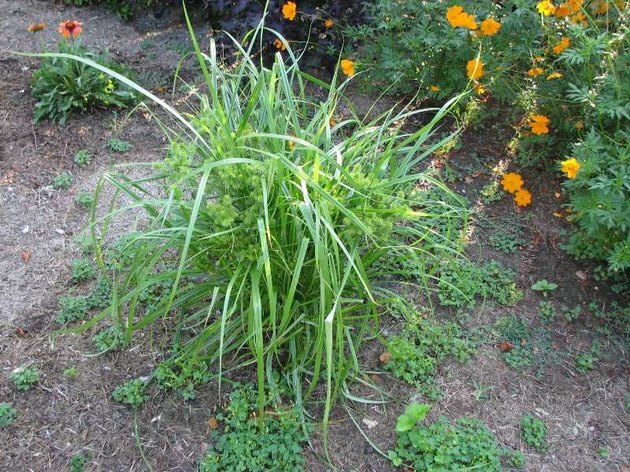 Crabgrass is an annual weed grass that thrives in sparse, poorly nourished lawn areas. It is hard to eliminate because it spawns numerous seeds in fall from which new plants emerge in spring. Organic treatment: Overseed thin turf areas to keep lawn full and healthy and crowd-out crabgrass. Mow grass no shorter than 3 inches. 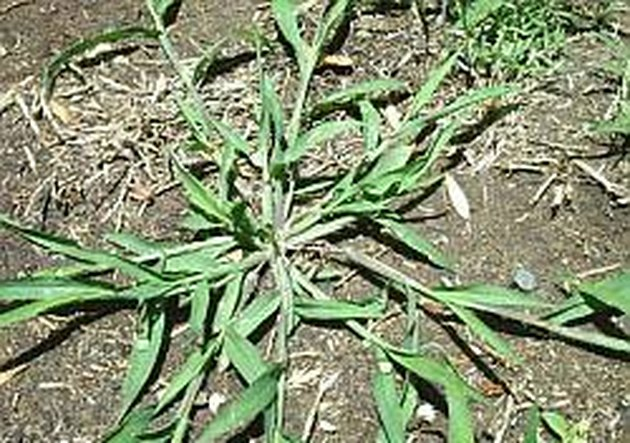 Collect grass clippings when mowing in late summer when crabgrass has purple seed stalks. Corn gluten meal can also help prevent germinate crabgrass seedlings from growing roots, gradually bringing crabgrass under control. Inorganic treatment: May need a non-selective herbicide containing glyphosate (be aware that this will kill grass and other plants, too). Broadleaf herbicides are often ineffective. 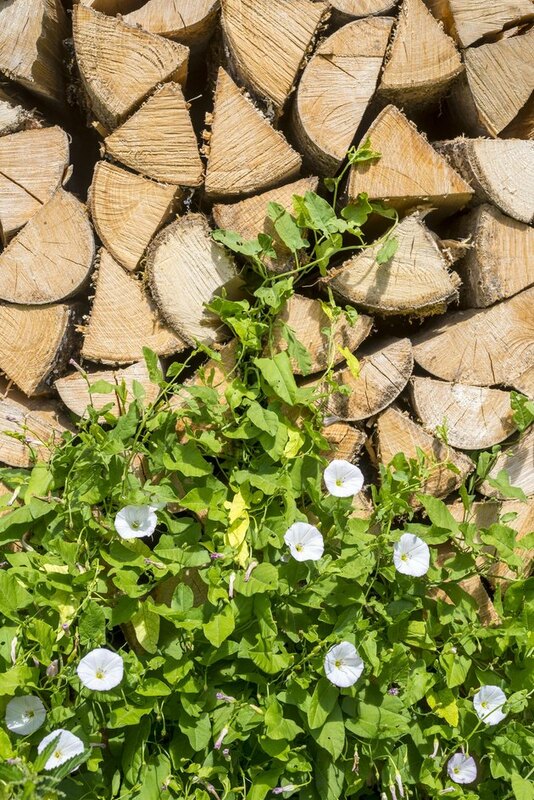 One of the world's most persistent perennial weeds, bindweed is viney and fast-growing. Its roots sprout in a matter of days and can survive deep in the ground for decades. Organic treatment: Hand-pull young plants, cutting or pulling off the foliage at ground level to deprive the plant of photosynthesis. Repeat every one or two weeks until the plant dies (this can take years). Inorganic treatment: Non-selective herbicide (glyphosate). Similar to bindweed, creeping Charlie (a.k.a. 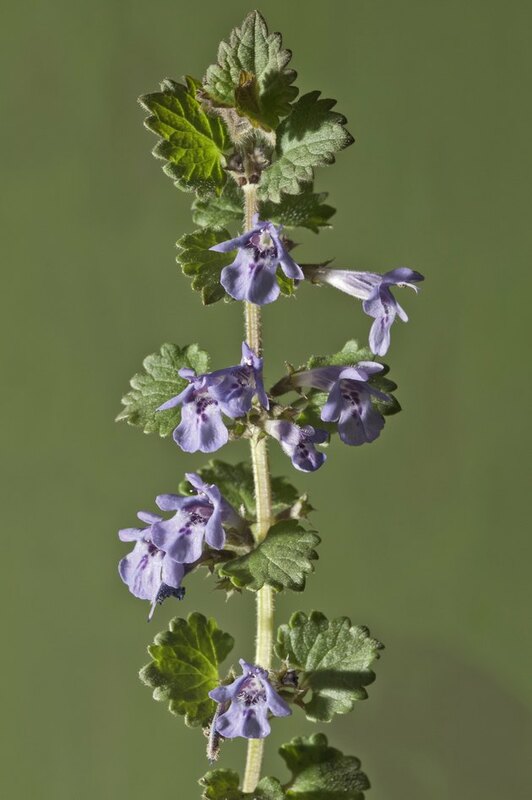 ground ivy) is a perennial weed that spreads as its leggy stems sprout from their nodes. It has light purple flowers and requires diligent eradication methods. Organic treatment: Same as bindweed. Also can be killed with a solution of 5 teaspoons Borax to 1 quart water; apply only once per year. Inorganic treatment: Broadleaf herbicide labeled effective for creeping Charlie. 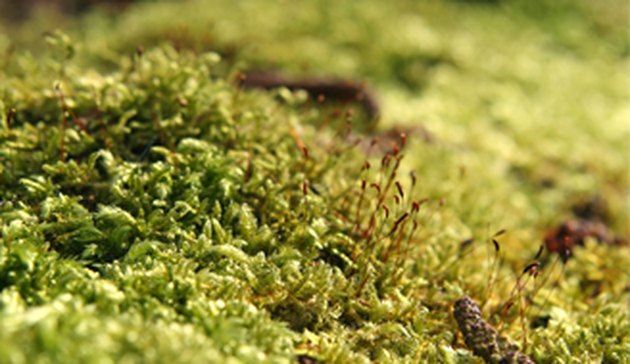 Moss grows in damp, shady areas with acidic soil. Unlike most other lawn weeds, moss spreads with spores. Organic treatment: Remove moss with a hard rake and a shovel, then reseed with shade-tolerant grass. Alternatively, kill moss with a solution of 1 ounce dish soap to 1 quart water. Inorganic treatment: Herbicide formulated for moss. Broadleaf plantain is a perennial weed that grows individually and in clusters and tolerates dryness, wetness, and clay soil. It has large, rubbery leaves somewhat like cabbage leaves and can spread to 12 inches in diameter. Organic treatment: Hand-pull carefully, using a weeding tool to get the complete root; works best when soil is wet. Inorganic treatment: Non-selective herbicide (glyphosate); broadleaf weedkiller. 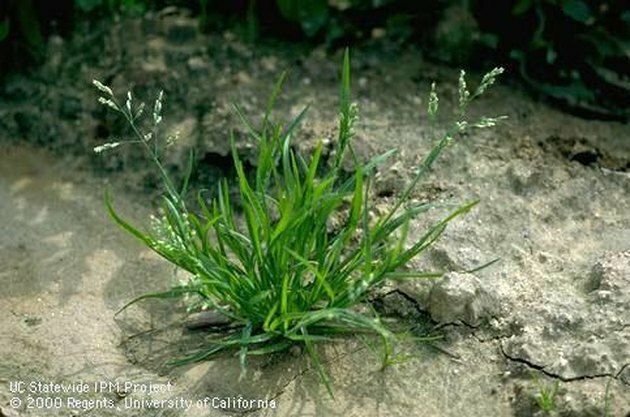 A rough-leaved grass that grows in clusters, quackgrass develops tall, wheat-like seed shoots. It spreads through seeding and grows from roots left in the soil after weeding. A perennial weed, quackgrass is quite hard to eradicate. Organic treatment: Hand-weeding by digging up the roots. As with many weed grasses, it will grow less if turf is kept thick and lush. 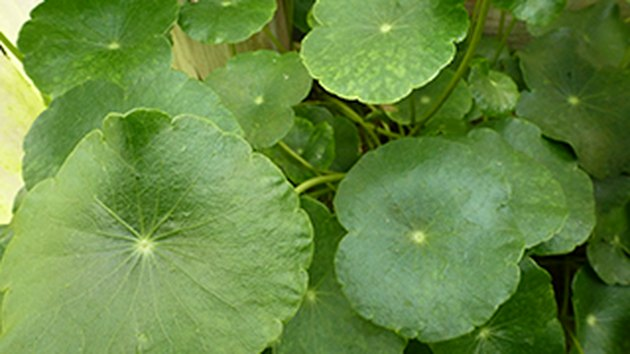 Also called pennywort, perennial dollarweed thrives in bare areas of lawns as well as in moist, shady spots. It has broad, roundish leaves and white flowers. Organic treatment: Avoid overwatering of lawn; water less frequently but more deeply. Hand-weed if weed spread is manageable. Not to be confused with perennial bluegrass plants, such as Kentucky bluegrass, annual bluegrass is a short annual weed with shallow roots. It likes areas with short turfgrass that receive a lot of water and fertilizer (golf-course greens are extreme examples). Organic treatment: Mow the lawn no shorter than 3 inches, and water less frequently and more deeply. Cut back on fertilizer if you use it heavily. Inorganic treatment: Best to employ organic treatment, but pre-emergent herbicides may prevent seeds from germinating. 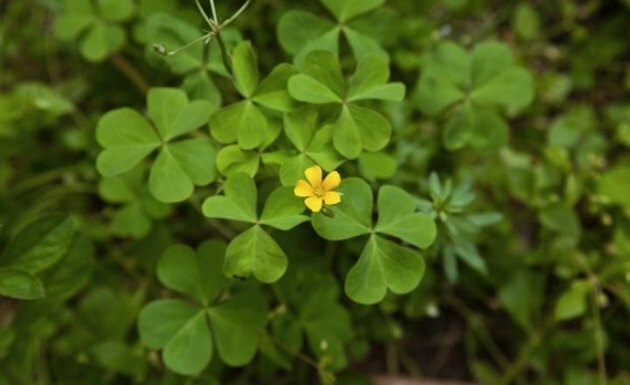 Also called wood sorrel, perennial oxalis has green or purplish clover-like leaves and yellow flowers. It thrives in thin, dry lawn areas. Organic treatment: Overseed and water deeply and infrequently to fill thin areas and crowd out the weed. Can be dug out when soil is very moist. Inorganic treatment: Locally applied broadleaf herbicide or seasonally applied fertilizer with weed control. 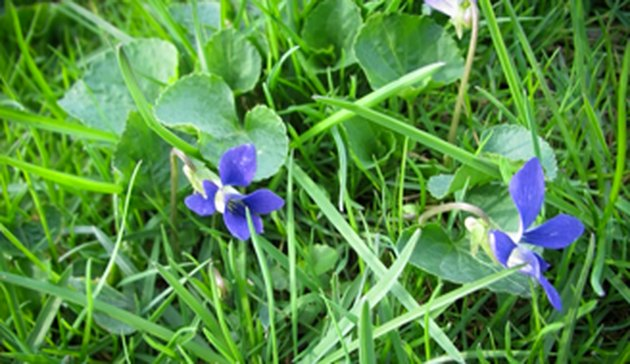 Considered by some to be attractive wildflowers, wild violet is an aggressive perennial weed in shady areas of lawns and is drought-tolerant once mature. It has heart-shaped leaves and purple flowers. Organic treatment: Hand-weed carefully and regularly to remove rhizomes (horizontal underground stems) and seeds. Inorganic treatment: Broadleaf herbicide slows but typically doesn't kill; non-selective herbicide (glyphosate) will kill. 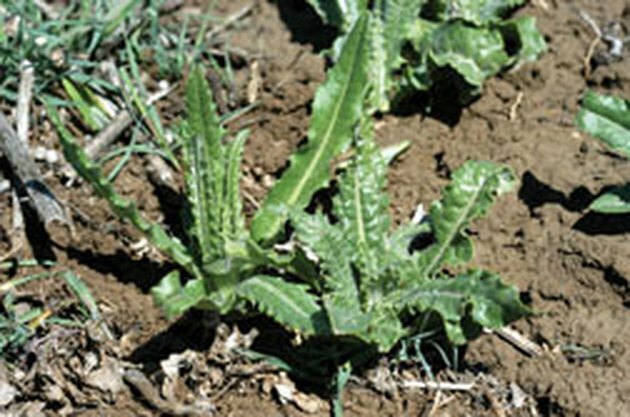 Thorny leaves and rapid growth make thistle an especially noxious perennial weed in lawns and garden areas. It spreads through seeding and root pieces and can grow up to 8 feet tall. Organic treatment: Hand-weed carefully to remove the entire root. Inorganic treatment: Selective herbicide is best when applied to newly emerged leaves in spring. 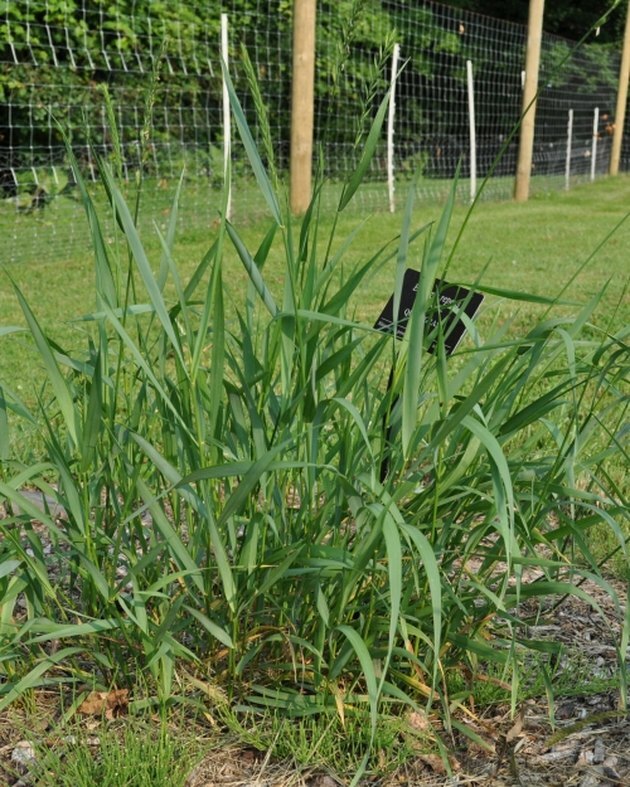 Nutsedge is a perennial grass-like sedge with triangle-shaped leaves. It thrives in clay soil and spreads by seeding and with subsurface nuts or bulbs. Organic treatment: Hand-weeding is ineffective unless you dig up the nuts and do not let the plants go to seed. Inorganic treatment: Locally applied herbicide specifically designed for nutsedge. 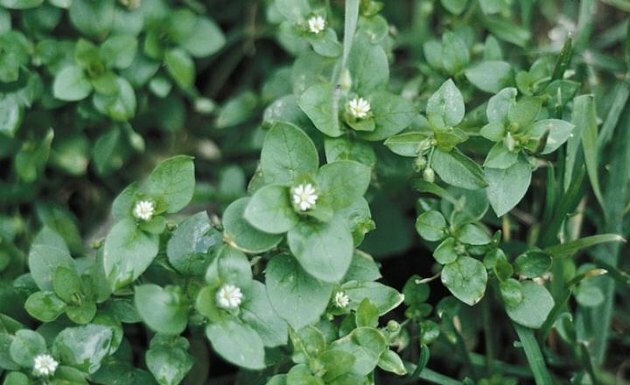 Chickweed includes both perennial and annual species. It has stems that help it spread far and wide and produces small white flowers. It grows in thin lawn areas and moist, shaded garden soil. Organic treatment: Hand-weed before the plants set seed. Inorganic treatment: Broadleaf herbicide, preferably applied locally. Identified by long, oval leaves with red stalks, dock is a perennial weed that can develop very deep taproots and up to 60,000 seeds per plant. Organic treatment: Spray frequently with vinegar, scuffing leaves to ensure penetration. Inorganic treatment: Locally applied herbicide; may require repeat application. 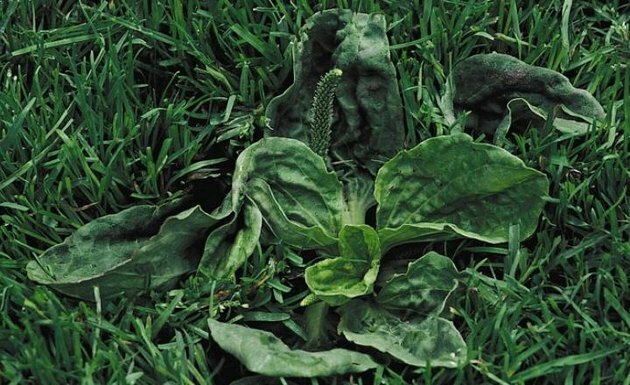 The most effective way to control weeds on any lawn is to maintain healthy, lush turf: The best defense is a good offense. You may opt for the speed of chemical fertilizers and weed killers to get a sick lawn back into shape, but once a lawn is well established, organic maintenance is best—for you, for the lawn, and for the environment. If your lawn needs a lot of help, one of the easiest ways to get a handle on general weed growth is to apply a fertilizer with broadleaf weed control, such as Scotts "Weed & Feed" products. Just be aware that these have limitations. You can apply them only twice a year, and they tend to merely slow the growth of most weeds rather than kill them. Therefore, it's best to follow up a fertilizer treatment with hand-weeding or a locally applied spray for broadleaf weeds at the recommended intervals. If you have a lot of weeds and not a particularly strong lawn, chances are the weeds will thrive more than the turf at the beginning and end of the growing season. This type of fertilizer treatment boosts turf growth while simultaneously hindering weed growth, giving the turf an advantage at these vulnerable times. A non-chemical general approach to weed control is simply to pull weeds by hand. This approach is labor-intensive and must be done frequently, but it is very effective with many types of weeds, and it is totally chemical-free. Hand-pulling works best if you do it regularly and if you remove weeds by the root, which often requires moist soil and/or digging tools. It's always best to pull weeds before they flower or seed. Also be aware that hand-pulling is less effective on weeds that can spread underground, such as bindweed.